UN sticks with climate agenda - but what prospects? Reports suggesting that UN Secretary-General Ban Ki-moon is retiring from the climate change agenda have had commentators wondering a) what it means for prospects of a new global climate agreement and b) whether the UN remains committed to the issue. What appears to be happening is that two realities have converged. One consists of indications that a new global deal remains some way away - certainly further away than the next UN climate summit in Durban, South Africa. The other is that a much more major event - Rio+20, Stockholm+40, Earth Summit Mark 2, Earth Summit 2012, whatever you like to call it - is now firmly on the horizon. It's happening in May 2012, which means that the UN chief and his officials need to devote a lot of energy to it now if it's to make a significant impact. With only a certain number of expert staff and resources to call on, some important people in Mr Ban's office will now be spending much more of their time looking to Rio, and correspondingly less to Durban - that's all. "Climate change is showing us that the old model is more than obsolete. It has rendered it extremely dangerous. It is a recipe for natural disaster. It is a global suicide attack." So that's the commitment question. But what about the prospects for that elusive global deal this year? Not good, reading between the lines. Since the last UN summit in Cancun, Mexico, developments suggest that a number of major governments are backtracking - not from their headline commitments, but - possibly more importantly - from the actions needed to achieve those commitments. We have seen Japan abandon its emissions trading plan over concerns on competitiveness. Australia has just scrapped a number of initiatives aimed at promoting green technology, such as the Green Car Innovation Fund, in order to pump more aid into flood-struck Queensland. These moves come on top of the Canadian government's defeat of climate legislation back in November. Meanwhile, in what's politically still the most important country in this context - the US - although the administration is ploughing ahead with proposals aimed at curbing carbon through the Environmental Protection Agency (EPA), what's equally clear is that opponents are building up a major head of steam. Challenges in Congress to the EPA's right to regulate greenhouse gas emissions look certain to happen. For President Obama and his team, this raises two questions: a) can the EPA maintain its mandate in the face of opposition? and b) how will the fight play out politically? Rio 2012 will have to find room in a packed agenda - how will rising temperatures fit in? This is the phase of the year when ideas are being gathered on how the UN climate process should run leading up to the end-of-year summit. But this time, the existence of Rio+20 provides additional context. Rio, and Stockholm before it, were not centred on climate change, even through the issue raised its head at both events. Instead they looked across the piece at the sustainability of human societies. This is where Rio+20 is heading as well. So what role should it play on climate change? Is it a place for big thinking or for smaller-scale, more tangible action? Should it give new impetus to the existing thrust of UN negotiations, or aim for a fundamental re-shaping of the process? For people who have spent the last 20 years striving to bring countries to agreement on climate change, does Rio+20 present an opportunity or a threat? The UN itself is pushing the theme of the "green economy" for Rio. But what exactly is that? And how are the twin ingredients of environmental protection and economic growth to be prioritised relative to each other? These are not straightforward questions, but they do bear down intimately on climate change as well as on other environmental issues. And they ought logically to play some role in shaping the UN climate process for the next decade, as well as shaping the policies of governments who will presumably sign up to whatever comes out of Rio, albeit - presumably - after the usual protracted wranglings and last-minute fudges. If the Arctic really is the "canary in the coal mine" for climate change impacts, as it's often been labelled, then it's a canary about which we know a little more following a spate of scientific papers coming out over the last week or so. And looking at what they say, as well as readings from instruments monitoring the canary's heath, the signs of sickness appear to be stronger and more certain than before. There are several distinct symptoms that need monitoring here: sea-ice area and volume, air temperature and wind, water temperature and currents, and the state of the Greenland icecap. Along with all this is the constant effort to interpret new data and see whether long-term beliefs about how Arctic weather works still hold true, or whether - as with the El Nino Southern Oscillation, for example - the sustained rise in global temperatures may change mechanisms people thought they understood. Greenland is especially important globally because of the potential of icecap melting to raise sea levels around the world. Andy Shepherd's research team shed a bit of light on how higher temperatures might affect ice loss with a paper in Nature this week showing that paradoxically, inland glaciers flow slower at higher temperatures. Essentially, there's so much meltwater that it runs away in channels under the ice, and doesn't lubricate the glacier's flow against the rock so well. However, what it means in real terms isn't clear, as several other mechanisms are in play that could work in the opposite direction (see Wednesday's news story for a bit more on this). Disappearance of ice from any part of the world will have an impact on albedo - the reflectance of solar energy back into space. 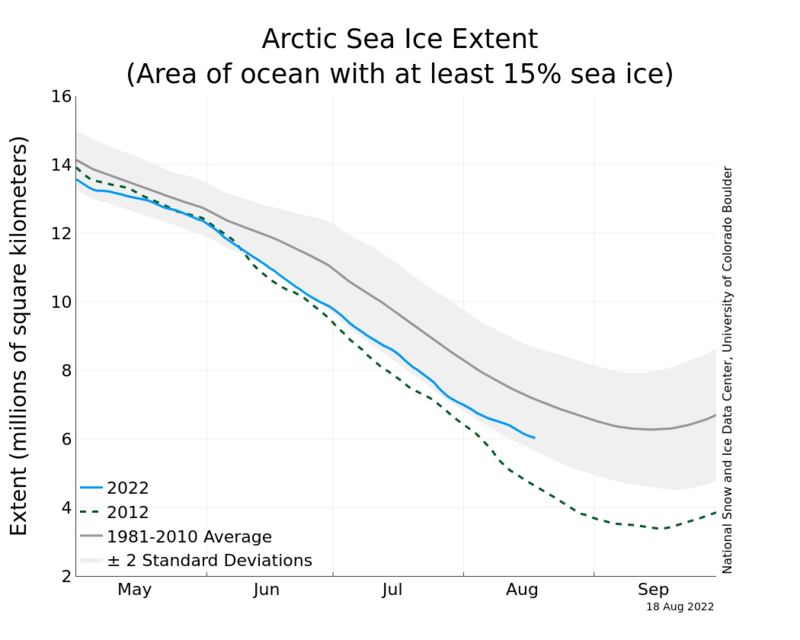 But because there's so much of it there, the Arctic ice on land and at sea is especially important. The steady shrinking of both has clearly led to a change in albedo and so, presumably, to amplification of temperature rise. In Nature Geoscience recently, Mark Flanner from the University of Michigan and colleagues calculated what the shrinking ice cover means for radiative forcing - the impact on temperatures. Climate Central has a good account of the paper, with commentary. But one figure alone is enough to give pause for thought: over the course of the satellite record, the net heating from this loss of albedo - the extra absorption of solar heat by the Earth - has increased by 10-20% - a huge change in just over 30 years. Ice is affected by higher temperatures in the air above and in the sea below. Warm water moves northward in the Atlantic Ocean by dint of the North Atlantic Drift, more colloquially known as the Gulf Stream. Whether the warmth affects the Arctic - and if so, whether its impact is changing - is a question that a team led by Robert Spielhagen from the University of Mainz in Germany addresses in this week's Science. Using a marine sediment record from Svalbard, they deduce that the temperature of Atlantic water entering the Arctic Ocean is higher than it's been for 2,000 years. The average temperature since 1850 is 2C higher than the average before - and comfortably higher than during the Mediaeval Warm Period, for example. "It's yet another hockey stick." "...Warming of the Atlantic water layer, unprecedented in the past 2,000 years, is most likely another key element in the transition toward a future ice-free Arctic Ocean." And what of that transition itself? At a briefing mid-week on the coming season's work by the Catlin Arctic Survey, Simon Boxall, who designed one of the projects they'll be carrying out this year, cautioned reporters (and I guess by extension everyone else) not to place too much importance on annual statistics. Some iconic ones do stand out in the annals of climate change history: 1998 with its strong El Nino spike, 2003 with its European heatwave, 2007 with its startling Arctic melt, and they make news. His point was that although summer melt records haven't been set since 2007, what we have had are four summers in succession where the ice has shrunk back further than at any other time since 1979. The winter maxima are showing a similar trend. And the latest plot from the US National Snow and Ice Data Center shows that another record low, this time for the smallest winter maximum, could be on its way; watch this space. Meanwhile, the ice volume, as calculated by the University of Washington's Polar Science Center, shows not just a steady decrease over the last couple of decades, but a decrease that's accelerated in the last few years. If it is accelerating, then it would be good to know why. But here, science inevitably has to play catch-up. Analyses of weather and climate depend on data, which must by definition come from the past; and you need a fair bit of data before you can start extracting rules. But the slow build-up of greenhouse gases, along with albedo changes and perhaps influences from events further south, may be altering the rules as we go along. A month ago, the Northern Hemisphere had the same kind of "upside-down" temperatures that we saw for large chunks of last winter, with the Arctic Oscillation in a "negative phase", bringing snow to western Europe and leaving parts of the Arctic itself basking in unseasonable warmth. See this often enough, and the question of whether we've entered a new regular weather pattern begins to be asked. "It may be that with a warmer Arctic, old rules regarding links between the atmospheric pressure patterns and sea ice extent no longer hold." What all this means for Greenland, and hence for sea levels globally, is less clear - and we're not likely to have answers before the next Intergovernental Panel on Climate Change (IPCC) report in 2013/4. Already, a fair proportion - I won't claim to know the exact figure, but I'd estimate it's over 90% - of Arctic researchers believe that for the region as a whole, the canary is already toppling off its perch. There's pretty strong criticism this week for the UN-backed initiative on Reducing Emissions from Deforestation and forest Degradation (REDD) - criticism timed for the opening, in New York, of the UN Forum on Forests. Reducing deforestation is something of a no-brainer - forest loss harms wildlife, releases carbon dioxide into the atmosphere, can damage water supplies and often brings no lasting benefit to communities living in the area - so why wouldn't you want to reduce it? Whether everything is rosy in the REDD garden is, however, another matter. For several years now, observers have pointed out that if you have a global initiative on forests that has rewarding carbon storage and retention as its single goal, you run the risk of damaging forests in other ways - at its direst, ending up with monoculture plantations of carbon-absorbing trees where no bird or monkey is seen. Hence the development of REDD+, which aims to include measures to protect the rights of forest communities and enhance biodiversity, along with the carbon storage. But according to the new analysis from the International Union of Forest Research Organizations (IUFRO), the trouble with REDD goes a lot deeper. Effective forest protection policies entail a move away from top-down initiatives such as REDD, they argue. Instead, governments must resolve to attack head-on the pressures that remove forests - such as the drive to open up new agricultural land, or to connect commodity supply with demand through the construction of roads that fragment habitat. Players who must be found appropriate roles include governments, communities, businesses and civil society organisations, it says. The report's a massive one and I won't attempt to summarise it all here - if you do want to dive in but don't have a couple of hours to spare I suggest you begin around Chapter Five, which looks at what we mean by forest sustainability and some ideas about how it can be achieved. The writers argue that there are successful examples in the world that can be used as models, or at least as sources of ideas. A few weeks ago, in a radio programme I made for BBC World Service, Costa Rica's former environment minister Carlos Manuel Rodriguez discussed several lessons learned from his country's attempts to curb the rate of forest loss and then replenish the stock. As a middle-income country, Costa Rica managed to halt and reverse deforestation through this raft of policies. Brazil seems to be going along a similar path; China has embarked on a huge tree-planting programme, partly in response to previous decades of rampant logging. Western Europe has begun to increase its forested area largely through having a stable population size, finding much of its food from imports and having chunks of the citizenry who are prepared to be quite vocal about their desire to have intact forests, not least for recreation. So it can be done and it is being done in different places; but it's a patchwork. As a global initiative, REDD+ takes the implicit view (as many other initiatives have before) that forests are in part a global resource, and saving them a global duty. "Global forest governance has not managed to halt forest loss or degradation. "It is not even clear that international forest institutions can claim any credit for the fact that rates of deforestation, although 'still alarmingly high' (FAO 2010), have slowed." Nevertheless, REDD is politically very much a going concern, and has the potential to deliver about $30bn per year for forest protection into the developing world. So you can see why people concerned at the "alarmingly high" rate of deforestation are keen to give it a shot. H for 'human': The missing climate link? As many commentators have pointed out down the years, virtually all the hopes expressed by governments in terms of reducing carbon emissions ultimately hang on technology. The Chinese government has talked about its one-child-per-family policy as being its historical contribution to curbing emissions (somewhat disingenuously, given that climate concern wasn't the reason for adopting it) - but it's just about alone on that. In fact, virtually no government intends to restrict the P in the equation, and certainly none wants to curb the A. Which puts the load squarely on T.
What this translates to, then, is doing everything we do now and more - but with less energy. It means using energy more efficiently, and adopting technologies that produce far smaller amounts of CO2 for each unit of energy. The equation is often used for the energy input side of things - but what about when we apply it to consumption? Is it entirely reasonable here to break things down into these components, or is it more complex than that? And if it is that simple, can T on its own produce enough change? In the European Union, when you go to buy a refrigerator, it'll be labelled with a letter indicating how efficient it is with energy - which consumers may look at if they're interested either in saving money or saving emissions. years to 2005. The least efficient new fridge freezer on sale today consumes only half as much energy as the least efficient products on the market eight years ago. consumption only reduced by 2.2% over the same period." In other words, the policy worked, to the extent that consumers chose more efficient products and manufacturers responded by making their ranges leaner and greener. But we also bought more fridges - negating the technological advance with changing behaviour, presumably related partly to increasing affluence, and perhaps partly from the psychology that says "I'm saving on this, so I can spend more on that". Couched in the terms of the IPAT equation, you could say that T reduced, but A increased commensurately - though I'm not sure that does it justice. Now, in the Journal of Industrial Ecology, Eric Williams and Liqiu Deng from Arizona State University have gone through the short but intense history of microprocessors, looking to see whether IPAT works there, and at what effect behavioural changes might have had in our use of them - and, therefore, our use of energy as it relates to computers. Chips have become much faster, of course, over the last 12 years - inside a typical home PC, by a factor of 10, the researchers suggest. And the amount of electrical energy needed per calculation has shrunk markedly. "... energy use per typical microprocessor is roughly constant over the 12-year period. "The explanation of this result is that although technological progress dramatically reduces the energy needed per transistor, it also induces demand for more powerful chips..."
The case is remarkably similar to 'fridges. The energy cost per unit of refrigeration - shall we call that unit something conventional like a litre, or go for something more visceral such as a pie, a rasher or a tinny? - reduces, but we just refrigerate more of them. A similar pattern cited by Deng and Williams concerns cars in the US. "There was a net increase of fuel use from 391 gallons per person in 1970 to 453 gallons in 2006." And environmentally, that's what's important. It's not, perhaps, a straightforward concept. Who is "demanding" functionality, for example, is an intriguing question. Were there gangs on the streets demanding television, or SMS text messaging, before they happened? I think not; yet now they're here, they're things societies wouldn't willingly give up. Where this leaves attempts to curb emissions isn't clear. But if T for technology is the crucial issue, it suggests we'd better understand more about drivers of use - what we're likely to adopt, what we're likely to demand and how industries will adapt to new challenges - because how H for humans use the stuff is perhaps going to be as important as the technologies themselves. Some fascinating threads on energy and climate change are swirling around the heads of Presidents Barack Obama and Hu Jintao as the two leaders convene in Washington DC. China's energy direction is assured - but is the US's? The "C-word" isn't being mentioned in despatches at all - but the E-word is, with a number of bilateral business relationships strengthened on the eve of Mr Hu's appearance at the White House. The two giant nations are facing somewhat different questions on energy. And as faraway the two leading emitters of greenhouse gases, the choices they make are obviously highly significant for the world's future climate. US energy demands are roughly stable. But it wants to be more independent of external suppliers, and the Obama administration wants to use less energy overall; so there are decisions to be taken on which options to pursue. China, on the other hand, needs more energy every year and is pursuing all options, with consumption of fossil fuels and use of renewables expanding rapidly, and an ongoing programme of nuclear reactors. For the US, China becomes a competitor in consuming oil and gas reserves, and potentially a competitor in the production of wind turbines and solar panels. That's one factor in US thinking, as the various strands of government struggle to plot an energy future. There are others. Cost is a big one, always; and here, fossil fuels and nuclear reactors still hold the whip hand, at least according to a recent analysis from the International Energy Agency (EIA). Security of supply considerations point to renewables, nuclear and coal - and to full exploitation of North American tar sands and shale gas. On the other hand, if world governments do decide in coming years that they're seriously concerned enough about climate change to initiate a full-scale transition to renewables-based generation, a massive investment in renewables manufacturing and deployment now could prove to be a good long-term move. Otherwise, China, India, and the EU will be well set to dominate the market. Snubbed by the Senate over comprehensive climate legislation, and chary of his chances of persuading a more climate-sceptical public, Mr Obama and allies such as John Kerry now couch prospective regulation in terms of energy security and green jobs. The problem is, those two factors can also point to shale gas and "clean" coal - which, as campaigners often point out, does not exist yet. On the other side of the Atlantic, Greenpeace and renewables consultancy Energynautics have just published a report showing that doing a bit of everything is not necessarily a good option. In particular, requirements for an electricity grid are very different if you plan for relatively few big generators delivering baseload power or lots of smaller ones delivering more intermittent or periodic power. "At times of peak production, renewables delivering clean and virtually free energy are already being muscled off the grid to allow nuclear and coal plants to continue running. "This is because wind and solar power is variable, while nuclear and coal plants are constant but inflexible..."
Choices grid companies make are also, however, determined by cost... which brings us back to the EIA report. It's been an unwritten assumption down the years by many in the climate field that climate priorities will decide energy pathways. Follow the science of climate change, the thought goes, and that will mandate how governments and businesses proceed - often with financial levers such as carbon pricing applied. However, looking at the current state of global climate policy, it's possible to argue that the converse is true - energy concerns are the drivers of climate policy. At its most obvious, it's why the Gulf states typically oppose tough emission curbs. But it's more subtle as well. China has set the targets it has - and remember, all nations' targets are now essentially unilateral - because it can meet them with an energy policy mix that it considers achievable and in the national interest, matching current and future economic priorities with concerns over climate impacts. The US, with its very different system of government, is feeling all the pressures, but not as yet coming up with any semblance of a defined response. Attempts to impose tougher regulations on emissions are being met with legal challenges and political opposition, and the likely success of those attempts is hard to gauge. "Parties should co-operate in achieving the peaking of global and national greenhouse gas emissions as soon as possible... [the UNFCCC] further agrees to work towards identifying a timeframe for global peaking of greenhouse gas emissions based on the best available scientific knowledge and equitable access to sustainable development, and to consider it at its seventeenth session [ie this year]." Given the urgency inherent in that statement and the pivotal position of the US-China rivalry in climate negotiations, you might conclude it's strange that the two leaders aren't talking about climate change this week. But with one country having made its energy choices, and the other struggling to do so against the backdrop of conflicting pressures - maybe it's not so strange after all. Real world of climate: How scary? Earlier this week I posted on uncertainty in climate model projections, raising the question of whether lack of certainty made the future more or less "scary" - and what it should mean for policymaking. "Richard's words clearly undermine the mitigation side of climate change...there is not enough detail to know what is the impact going to be, where it is going to hit and when." "What do those who are adamant on not even trying to accept the possibility that humans may have been damaging the environment and on a greater scale, the Earth really want to do? "Most probably, in their opinion, we just should keep on polluting, killing and destroying everything that gets in the way?" Still working without a time machine that can visit the future and tell us, there is another way of trying to evaluate climate impacts. It consists of looking at what's happened in the Earth's past and attempting to calculate what that tells us about the future. Especially for anyone who takes computer models to be GIGO-flop processors - Garbage In, Garbage Out - this should be an attractive option, depending as it does on real hard facts that can be taken from the real physical world around us (even if interpreting these facts is tricky – see below). In this week's Science, Jeffrey Kiehl from the National Center for Atmospheric Research in Boulder, US, reviews evidence from these "real past world" studies - and presents a vision scarier than the projections of computer models. As he outlines, if the atmospheric CO2 concentration keeps rising as it has, by the end of the century it could well have risen to around 1,000 parts per million - about four times the level before the Industrial Revolution. Take the time machine back about 50 million years, and this was the norm - periods of high CO2 concentrations and higher temperatures than now [pdf link], leavened with cooler, lower CO2 interludes. You can find a number of analyses concluding that typically, it was a few degrees warmer than now (I like the visual clarity of this Rob Rohde reconstruction). But via calculations involving several recently-published papers, Jeff Kiehl sets out why temperatures could at times have been much hotter than that - a global mean 15C above the present, with concomitantly higher sea temperatures that would certainly challenge the life prospects for many current marine organisms. "Thus, if atmospheric CO2 reaches 1,000ppmv, then human civilization will face another world, one that the human species has never experienced in its history." The reason why these large temperature rises could occur is, he explains, down to long-term feedback processes such as the melting of icecaps and vegetation changes, which materialise over centuries or millennia. These aren't typically included in computer models, aiming as they generally do to project over a century or so at most. As with computer models, interpreting palaeological evidence isn't straightforward. For one thing, the Earth hasn't kept records perfectly tailored to our current research needs. Secondly, and deriving from that imperfection, interpretations vary between scientists. Thirdly, Planet Earth isn't exactly the same as it was 30 million years ago - partly because seven billion humans have done much to change it besides enhancing the greenhouse effect, such as reducing forest cover. So deducing the future from the past wouldn't be straightforward, even if the dataset were perfect. But as with the glacier projections I flagged up in the earlier post, what this analysis raises is a question of risk. Our generation isn't looking at bequeathing our children or grandchildren a 15C warmer world - it'd be many generations after that down the line, if it comes at all. But do we want to take that risk, when the real world evidence can be interpreted so as to project such an outcome - a true hothouse? Or are we ok with that? Do the doubts in the interpretations mean we can sleep easy on a bed of business-as-usual? In Schrodinger's famous thought experiment involving an unsuspecting, limbo-bound feline, the mere act of observing something can change its state. In the real wild world, it's not supposed to happen - to cats or other animals. The very idea of ecological science as it's practised nowadays is that what you see when you go into the great expanse of nature is the reality; that you're observing animals doing what they do, unaffected by your presence. It doesn't always work out like this. And in this week's Nature, Claire Saraux and her colleagues report a 10-year project on penguins that demonstrates pretty unequivocally a big problem associated with the standard research tool, the flipper band. As my news story relates, in a nutshell, the bands harm the penguins - slowing their foraging, shortening their lives and having a major impact on their breeding success. So for anyone wanting to use flipper bands on penguins while they're at sea now, there are two dilemmas. Firstly, will the research produce a conclusion that's reliable - that isn't distorted by the bands? And secondly, are the project's aims important enough to justify harming the birds? King penguins, the species used in this study, are pretty abundant, with an estimated population in the millions; so there's no conservation reason why shortening the lives of some would be an issue. Even so, many of us would think twice about the ethics of research that carried these consequences. There are other types of tag available for penguins, and in some species it's possible to identify individual birds by their markings. So there will sometimes be alternatives, but not always - and then there will be an ethical decision to be made. Sometimes the dilemmas are not easy. Last month, an international research group began tracking a western gray whale from the coast of Sakhalin to... well, to wherever it goes. This is one of the most endangered whale populations in the world, with only about 130 remaining. They feed off Sakhalin - but where they go to breed, and the route they take, are unknown. And all the while it's unknown, it'll be impossible to give them a helping conservation hand. It looks unlikely that the satellite tag is harmful - whales have been tagged since at least the 1950s, and then with robust 25cm-long metal spikes designed to nestle inside the blubber until the animal died - so they can clearly stand it. But if it were thought likely to compromise the whale to which it's attached, would the research have gone ahead? Would it have been worth harming one whale in order that the whole population could be better conserved? Lethal research whaling - as practiced now by Japan - is obviously terminally harmful to the animals involved. A couple of years ago, Japanese scientists published a scientific paper detailing how the blubber thickness of Antarctic minke whales had declined over the decades. Here's a finding that could tell us much about how the Antarctic ecosystem is responding to climate change, fishing and other forces too; or perhaps - more controversially - how the recovery of larger whale species is affecting the minkes' food supply. Because of squeamishness about where the finding came from, the authors reportedly submitted the research to several scientific journals before finding one willing to publish it. Yet now the data is out there, all scientists in the field will be able to use it - and use it they should, because it's an important finding, potentially relevant to much more than whales themselves. Could it have come through any other source than lethal research whaling? If so - and bearing in mind that the Antarctic minke is an abundant species - does it justify the killing? You might argue it does not, on the basis that thousands have been harpooned; but what if it had just been 20 or 30 - would that have been ok? In many parts of the oceans, you can find fishing boats engaged on something that might sound like an oxymoron - fishing for conservation. Scientific sampling of ocean areas determines fish abundance. Trials with new nets aim to reduce bycatch, or improve the specificity of fleets for certain fish species or ages - but again, fish die in the process. Occasionally, the mere presence of conservation scientists has been enough to damage wildlife. On several occasions over the last decade, chimpanzees in Tanzania's Mahale Mountains National Park contracted viral infections that were traced back to human visitors. And nearly 20 years ago, conservationists attempting to look after the midwife toad of Mallorca inadvertently gave the animals the one thing they really didn't need - an introduction to the frequently lethal fungal disease chytridiomycosis, the spores presumably carried into toad colonies on human boots. Yet when you think of the fantastic amount of work that scientists have done to study, conserve and raise awareness of the plight of Africa's non-human primates - and how much work is needed to stop chytrid and other threats decimating amphibian species - you might conclude that a few sick apes and a few dead toads were worth it; or you might not. One of the first principles of medical ethics is "first do no harm" - and some have suggested this could usefully be adopted for conservation too. But the only way to be sure of doing no harm is to do nothing at all... and then it becomes very difficult to do any good. So what are we to make of it all? What have I missed? And might Schrodinger usefully have put a monkey, a whale and a king penguin in with his quantum mechanical cat? Glacier melt will contribute to sea level rise - but how much? Given the importance of glaciers in regulating the water supply for a fair fraction of the Earth's population - given also the recent furore over the likely melting date for Himalayan glaciers - there's possibly no hotter topic in climate science than plotting the future of the world's ice bodies. As with other aspects of climate change, we're dependent (in the absence of a time machine) on computer models to indicate the range of possible futures. Unfortunately for policymakers and citizens who need good regional projections on which to base decisions, the range of possibilities can be pretty large. The latest example of this is a paper on mountain glaciers, just published in Nature Geoscience, by Canadian-based researchers Valentina Radic and Regine Hock. Overall, all the computer models they used in their study projected that glaciers will shrink in the years up to 2100; but even at the global level, there are big differences. At the extremes, the Canadian CGCM3.1 model projects twice the ice loss of Nasa's GISS-ER model, for example. People don't get their water supplies from global reservoirs, of course, but from their neighbourhood. And when we get down to these levels, the differences are even more stark. For many regions, there's a three- or even four-fold difference between the minimum and maximum projected loss. And for the impacts of glacier melting on global sea level rise, projections for many of the regions run from essentially zero to several centimetres. For context, it's worth emphasising that this is state-of-the-art science. It uses (generally) the most modern versions of models from leading research institutions. It uses the most comprehensive dataset available - the World Glacier Inventory, which now contains details of more than 120,000 glaciers around the world. "...the most comprehensive study of mountain glaciers and small ice caps to date." "Many of these glacierized regions are still facing large uncertainties in the climate projections due to the choice of GCM (global circulation model)." How fast models' capabilities will increase is anybody's guess - partly because funding for new big science projects is scarce in many nations, partly because there are still big gaps in understanding of how oceans and the atmosphere work, and partly because when it comes to projecting trends such as glacier loss, the path human society takes in terms of economic development is a key factor, and that's certainly a known unknown. Invest in extensive water management facilities that can replace glaciers, in the full knowledge that they might not be needed? Or put off investment until another day, when the likely extent of glacier disappearance becomes more readily predictable from observations, but by which time the solutions available might be more expensive and difficult to implement? If you take the view that human society never will get to grips with carbon emissions because we are inextricably wedded to cheap energy and fossil fuels - the view that all the coal and gas and oil available will inevitably be burned - then the science suggests the disappearance of glaciers from many regions is a given - it simply becomes a question of "when?" European glaciers are projected to lose 50-90% of their ice - an acceptable risk? The point has been made in many fora down the years that climate change policy isn't a question of looking for exact forecasts of impacts and deciding what to do about it. Are you willing to accept the risk that the European Alps could lose 90% of their ice by 2100, or New Zealand's ranges 85%? What about Antarctic islands, or the mountains of the Caucasus? One of the most succesful tactics that groups opposed to climate action down the years have employed is to cast doubt on the science - often by pointing out the scale of uncertainties in published research. Campaign groups have on occasion sought to counter this by playing down the uncertainties and claiming that certain climate impacts are certain - claims that can rebound if the science is shown not to be so certain. However, some observers have maintained that it's the uncertainties that make things really scary - largely because policymaking then becomes a judgement call based on guesstimates and susceptible to influence from all sorts of political and economic forces, rather than a logical response to a quantified threat. Fresh water is one of the few things none of us can do without. The latest research confirms that the natural storage systems that supply fresh water to many millions of people are likely to undergo dramatic changes in the next century. Precisely how dramatic, though, is a question that cannot be answered precisely; and policies will have to be made in the full knowledge of that fact.